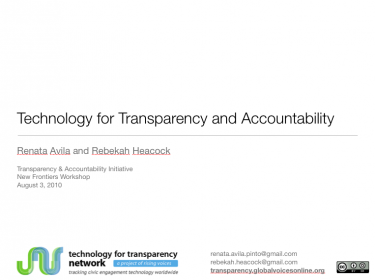 As we move into the second phase of the Technology for Transparency Network, Renata Avila and I have been working on a better mechanism for categorizing and sorting the dozens of organizations profiled on our site. One of our goals is to make it easier for users to find projects based not only on the country in which they're located but also on the particular sector or issue on which they focus and — we are the Technology for Transparency Network, after all — the different tools they use. 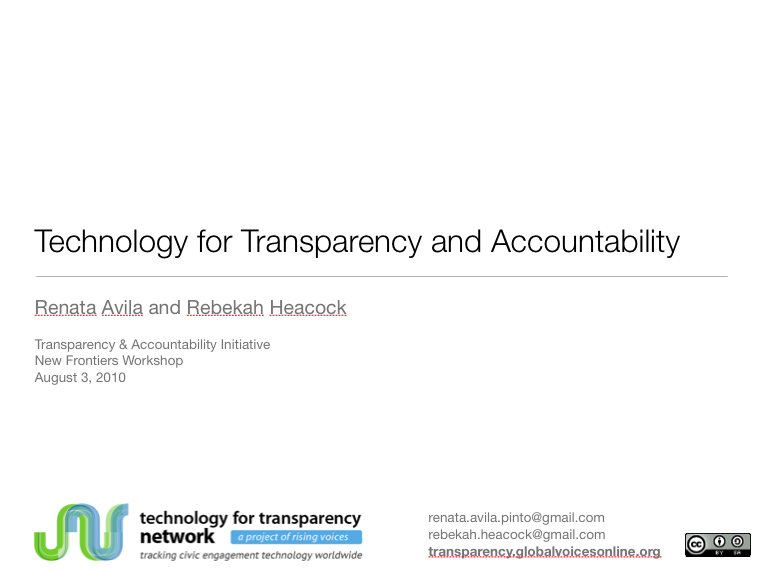 As part of this process, we recently gave a short presentation to a group of transparency researchers on the five lessons we've learned so far about using online and mobile tools to promote transparency and accountability. The tech for transparency field is a rapidly changing one — between the time we presented and now, crowdsourced mapping tool Ushahidi launched Crowdmap, which lets anyone with Internet access set up an Ushahidi instance without having to install Ushahidi on their own server. What that means is that the lessons and technologies we outline below are a work in progress, and we welcome your comments and questions. After we publish our next round of case studies, we plan to revisit these lessons and see what has changed. In places where governments and corporations can't or aren’t willing to share information (or don’t maintain it in easily accessible formats), citizens are sometimes the best source of data about government and private sector activities. A number of tools exist to facilitate the collection of this data, either from open crowdsourcing, from a specific group of people such as trained volunteers or workers (this is often called “bounded crowdsourcing”), or from a combination of both. The information gathered from people online or via mobile phones can be used in addition to existing data (for example by supplementing more traditional election monitoring efforts) or to shed new light on processes or power structures (for example by monitoring the results of development projects). Data collection can take place on multiple devices and systems, depending on the desired outcomes and the operating environment. Some services, such as Frontline SMS, operate largely via simple text messages, while others, such as Ushahidi, employ multiple methods, including SMS, Twitter, e-mail and web forms. The Network of Mobile Election Monitors of Nigeria (NMEM)was established to monitor the country’s 2007 presidential elections. Official election monitors are often limited by time and geography, as well as by their official status — their visible presence at polling places may reduce the likelihood of irregularities at that particular place, skewing the results of the observation. NMEM partnered with Frontline SMS to create an election monitoring system that would help citizens engage with the political process while overcoming some of the problems associated with traditional election monitoring efforts. Registered, trained associates in each of Nigeria’s states monitored the election while spreading word of their efforts to voters, who were encouraged to send in reports as well. Over 10,000 messages were received and cross-checked for accuracy. The final report echoed the results of international observations but gave Nigerians more agency in the political process. For more information, see NMEM's final report (PDF). Many governments and companies that put their data online do so by scanning hard copies of giant documents and publishing them as hard-to-analyze PDFs. In other cases, the data that exists is too much and too complicated for the average citizen to understand. A multitude of tools exist to help put data online in easy to use, easy to navigate ways so that citizens can see what facts and figures are most important. Citizens who have access to and understand the facts of a situation are better able to hold governments and private sector organizations accountable. The Haiti Aid Map provides detailed information on the current humanitarian and aid efforts in Haiti. Visitors to the site can sort through the information by aid organization, by aid cluster or sector, and by location. The map takes over a billion dollars worth of aid activity and makes it easy to see who is doing what where. Worldwide, three times as many people have access to mobile phones as to the Internet (PDF). In developing countries — whose populations make up 64 percent of the world's mobile phone users — the ratio grows as high as five to one. Tools that operate exclusively on the Internet ignore a huge group of potential users, but luckily, tons of mobile platforms and applications exist that help organizations reach this group. Even the simplest text-and-talk-only phone can let citizens report problems and obtain information. Kenya has only 4 million Internet users, but over 19 million mobile phone users (source: World Bank). The Budget Tracking Tool lets citizens find information about the money that has been allocated for development projects in their region using a simple text message. The site gets between 4000 and 4500 SMS queries per month, and citizens have used the information they’ve obtained to expose corruption at local and national levels of government. In order to use technology effectively, you need to meet people where they are. If people are already using a Facebook group to protest a particular government action, it may not be worth it to build a new platform with the same features and spend time trying to draw people over. Though Facebook, YouTube and Twitter weren’t build with transparency and accountability efforts in mind, they can be effective tools, and they come with built-in audiences. When building a program based on existing tools it’s important to keep in mind the fact that tools available in one area or language may be inaccessible in another. For example, Orkut is one of the most popular websites in Brazil and India and may reach more users than Facebook in those countries. In 2007, the number of trips the Tunisian presidential plane was taking attracted attention from bloggers who wondered why, when the president was in Tunisia, his plane was in Paris. One blogger browsed photos on aviation enthusiast websites and found photos of the presidential plane in a number of European capitals. He tracked the plane around Europe and discovered that the president’s wife was using the plane to support her shopping trips — a clear misuse of state funds. He used Google Earth to map the plane’s trips, photos to back up the map, and YouTube and Vimeo to publish a video of what was happening. When working with digital tools, be careful not to “fall in love with your creation.” You can spend time and money creating the best digital platform in the world, but if your target audience is more used to radios than to computers, the impact will be small. Some of the most successful projects are combining digital and traditional tools to reach people no matter what level of technology they prefer. These organizations recognize that the best tool to promote transparency and accountability is the one citizens will use. Radio, print, television, call centers and public meetings may not be as flashy or exciting as digital platforms, but in some situations, they may have a greater chance of success. Freedom Fone is an almost entirely voice-based system. Organizations can download the software for free and purchase the necessary hardware for under 100 Euro/126 USD. End users don’t need a computer and don’t have to use SMS — they simply call in. Freedom Fone points out that “delivering information through the audio platform overcomes barriers associated with literacy and language and enables users to move past the 160 character limitation of an SMS.” Organizations can use the system to disseminate information, conduct polls, or collect citizen reports that can then be tagged and processed using Freedom Fone's software. Guatemala Visible tracks the selection processes for judges, the General Prosecutor, the Accountant General, the Public Defender and the national Ombudsman in Guatemala, shedding light on process that has previously been conducted behind a wall of secrecy. In addition to making information available online, the project used printed posters, ads on bus stops, local language community radio broadcasts and television to raise awareness. How to best use a technological tool depends on the desired outcome, the location, the language, and the technological environment, among other factors. For example, governments and NGOs may openly publish their budgets, making visualization and data navigation more important than crowdsourcing for projects that focus on budgets and donor aid. But if the goal is to compare what has been promised with what is being delivered, crowdsourcing reports of what’s happening on the ground may be the most effective way to promote accountability. In some contexts, the best way to put easy-to-understand information in the hands of citizens may mean developing an iPhone app with flashy graphics and the ability to share information with Facebook. In others, it will involve simple SMS queries and a radio program. In a diverse world, it is important to start by looking at the tools available to the people you want to engage. The most advanced technology might fail if people are not familiar with it, if they cannot afford it, or if they can’t adapt it for their purposes. This means being willing to give up on complex technologies if what the community needs is SMS and radio-based efforts. It means building simple, text-only websites if bandwidth is limited. Overall, it means paying close attention to the context of a project and implementing technology only where it really fits. This post was co-written by Renata Avila.